Readers and visitors to the Library since the spring have been able to enjoy six works by Ulyana Gumeniuk which hang in the Entrance Hall. 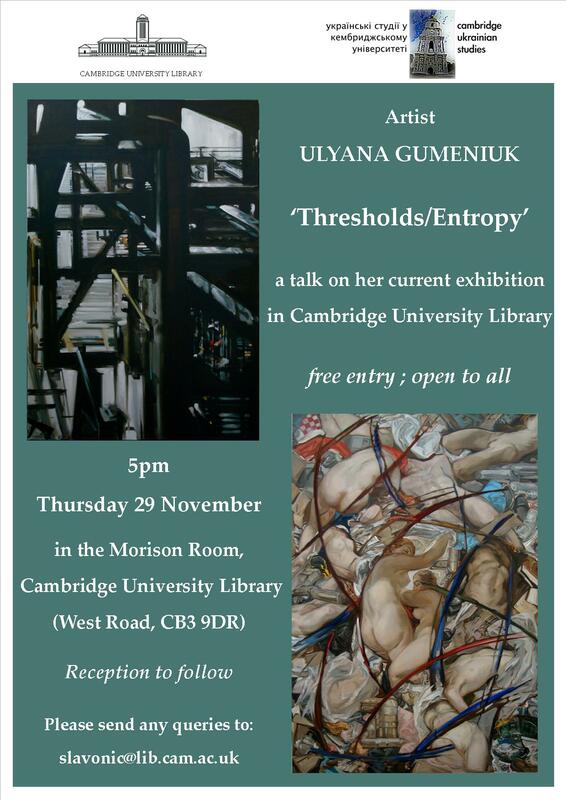 We are pleased to announce that the artist will give a public talk on this exhibition, named 'Thresholds/Entropy', explaining the origins of the ideas and the influences in her work. The talk will feature a slideshow of pictures that cross-reference the source of her ideas and the painting themselves. The talk will take place in the University Library's Morison Room, which is accessible from the Entrance Hall through the Exhibition Centre. Admission is free, and all are most welcome. The talk will start at 5pm and will be followed by a drinks reception. The talk and indeed both the Ulyana Gumeniuk exhibition and her father Feodosiy Humeniuk's exhibition are the results of close collaboration between the University Library and Cambridge Ukrainian Studies. A pdf of the poster of the talk can be downloaded here. 'Thresholds/Entropy' will be in the Entrance Hall until early April 2013. An online exhibition of these paintings is available here for those unable to visit the Library, and the text of the accompanying leaflet is available here.